As the nation pauses on Patriot Day, Friday, Sept. 11, 2015—the solemn anniversary of 9/11, the day that changed America forever—it is necessary to honor the fallen, their loved ones, and all the heroes who served and continue to serve. We must honor them eternally and in remembering 9/11, we must be passionately dedicated to transform America. The victims from the World Trade Center, Flight 11, Flight 175, Flight 77, Flight 93, and the Pentagon will forever remind us of that fateful day. All across America—in our churches, synagogues, mosques, communities, homes, and hearts—we must pray for the repose of their souls and for peace in the hearts of their families, friends, and communities. As America solemnly reflects on of 9/11 and mourns for the nearly 3,000 lost lives, we must remain vigilant in securing and strengthening our nation. America must not ever allow their passing to be forgotten. We must remain vigilant and rededicate ourselves to the virtues inspired by the 9/11 tragedy: compassion, honor, patriotism. 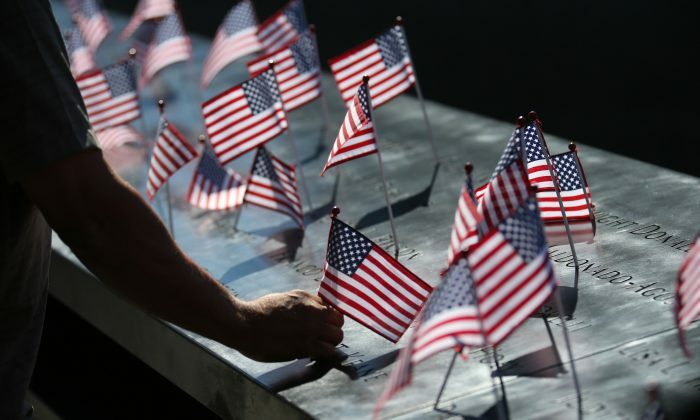 The anniversary of 9/11 must inspire our country to honor countless heroes who served victims and their loved ones. These heroes, many of whom are unsung, represent the best in all of us and rose to the occasion from every imaginable profession, nationality, religion, and ethnicity. America is forever grateful for these dedicated men and women—including our military—and their tireless service to community, colleagues, and country. In January 2006, I attended the funeral of NYPD Detective James L. Zadroga in North Arlington, New Jersey. Detective Zadroga, died at 34 years old, of a respiratory disease attributed to his heroic participation in rescue and recovery operations in the decimated World Trade Center site following the 9/11 attacks. Zadroga was the first member of the NYPD who died as a result of his exposure to toxic chemicals at the attack site. Although Zadroga was a healthy nonsmoker, he developed a chronic cough immediately after his work began in the rubble. Within months of his valiant work at the site, his health deteriorated into shortness of breath and the inability to walk very short distances. Although I was not privileged to personally know this 9/11 hero, Detective Zadroga was the son of my colleague, Chief Joseph Zadroga. Chief Zadroga and I worked together for many years on numerous community policing, school violence prevention, and terrorism awareness initiatives for the Bergen County Law & Public Safety Institute in Mahwah, New Jersey. Honoring Detective Zadroga and all 9/11 heroes, the James L. Zadroga 9/11 Health and Compensation Act was enacted five years ago. This law justly provides compensation and health coverage to heroic firefighters, police, first responders, and other suffering from health ailments associated with toxic air they breathed at ground zero after the attack. This act is now up for extension. Otherwise, it will expire and leave individuals who have fallen sick without coverage. Congress must act swiftly and decisively in the name of justice, ensuring the Zadroga Act is permanently extended with the funds required for 9/11 victims. America must rise from the 9/11 tragedy with dedication to renewal, transformation, and triumph in our great land. Our nation must shine as a beacon of compassion with assistance to those suffering from the consequences of 9/11 and the vigilance needed to prevent additional tragedies. The lessons learned from “The 9/11 Commission Report: Final Report of the National Commission on Terrorist Attacks Upon the United States” must be reviewed, understood, and implemented to ensure America’s security. A nation champions leadership, vigilance, and collaboration when it remembers those in need, remains dedicated to security, and responds with full force with understanding, justice, and benevolence.